A. There is the actual set of words that comprise the communication, which can be evaluated for meaning, but only incompletely. B. What the theory underlines is that speech doesn’t just say something, it is always delivered with the intent to do something. Some acts of speech are typically used as clear examples, such as, “I pronounce you husband and wife” … in the right context, those words actually do something. In reality every act of speech is given with the intent to do something. There is the intended impact of the speaker that is communicated with and by the actual words used. So you might use the same set of words, but with different intent depending on numerous other factors, to communicate the following: a threat, a promise, a flirtatious hint, etc. C. Once we open up the realm of the intent of the speaker beyond mere analysis of propositions (which we automatically do as listeners), then there is a third measure to bring into the mix . . . the actual effect of the speech-act. What actually happens may be intended or unintended, and it may be multi-layered. 1. Do people take our tone in the way we intend? You might mean to come across as loving in what you say, but actually be felt to be antagonistic, negative or aggressive. You might intend to couch certain content in a tone of hope, but come across as uncertain and hesitant. 2. Does the main goal of the message get through? We do look to God to bring about transformation, but that doesn’t excuse us from prayerfully intending certain impact. Are we seeing that impact over time? 3. Do secondary but significant goals get achieved in your preaching? For instance, you might intend for your listeners to be motivated to read their Bibles during the week, but does your preaching bring about that motivation? 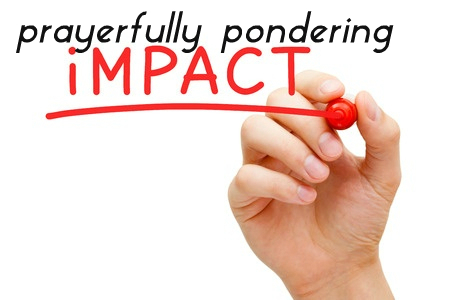 Prayerfully pondering actual impact might lead to some tweaks in your preaching that will help your church.